What cha’ got to sell? Growing something tasty? Baking something sinfully sensational? Are you the producer of the must-have, can’t live without, gotta have it now… thingamajig sauce? 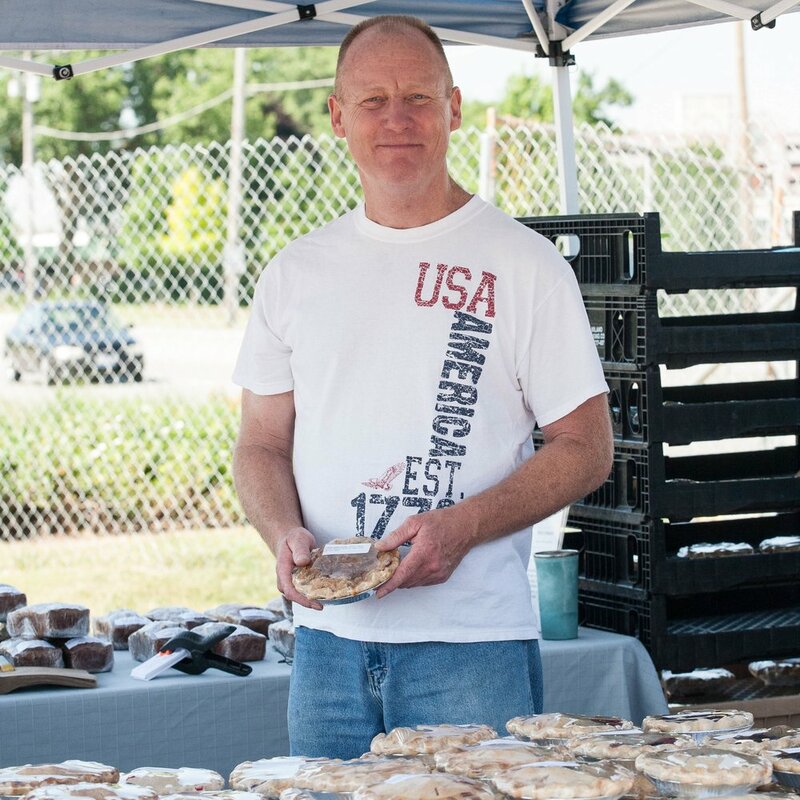 Aurora’s Farmers Market is always interested in exciting new and exceptional vendors. While our preference is for full season participation, we accept new vendors at any time during the year. Vendors are selected in keeping with the markets objective of a healthy lifestyle, including natural, locally produced, organic, hand-crafted, or specialty items that are unique and would attract a variety of patrons to the marketplace. Learn more about the types of vendors at Aurora's Farmers Market and complete the Inquiry Form below. Farmers offering for sale items such as vegetables, fruits, grains, cider, nuts, grains, berries, herbs and plant materials that the grower grows or produces. Vendor is responsible for all necessary Kane and/or DuPage County Health Department permits and licenses. Any vendor with or without a retail outlet offering a product that is NOT for on-site consumption such baked goods, meats, cheese, preserves, prepared foods etc. Vendor is responsible for all necessary Kane and/or DuPage County Health Department permits and licenses. The Concessionaire category is any person licensed to do business at a permanent location in Aurora, licensed as a peddler in Aurora, or registered for the City of Aurora Food and Beverage Tax with a posted $250.00 bond, offering products, both food and beverage, primarily for consumption on site. Vendor is responsible for all necessary Kane and/or DuPage County Health Department and must have a fire extinguisher onsite at all times. Food Trucks must submit a Fire Prevention Vendor Application to Aurora Fire Prevention. A small scale farmer with no retail outlet or business, typically less than three (3) acres in production and usually limited to a single specialty crop/product offering items such as vegetables, fruits, berries, herbs, honey, eggs, etc. that the farmer grows or produces. Vendor is responsible for all necessary Kane and/or DuPage County Health Department permits and licenses. An individual who prepares products in their own residence kitchen for direct sale to customers by themselves or a family member. Certain homemade foods such as baked goods, jams, jellies, preserves, fruit butters, dry herbs, or dry tea blends are allowed. Cottage producers must register with the county health department of residence and must have a current Illinois Food Service Sanitation Manager Certification. A cottage food operation shall comply with the labeling requirements of the Illinois Food, Drug and Cosmetic Act and Vendor is responsible for all necessary Kane and/or DuPage County Health Department permits and licenses along with any additional required certification prior to selling. Learn more about what is required here. A vendor, without a retail outlet, that sells unique handcrafted items which they themselves manufacture, such as, but not limited to, woodworking, pottery, candles, needlework, art, photography, soaps, pet treats, etc. All items must be produced within their home/workshop and are subject to approval at the Market Manager’s discretion. The vendor shall comply with the labeling requirements of the Illinois Food, Drug and Cosmetic Act where applicable. Any vendor, product representative, or franchisee that resells products that they did not produce, such as; candles, Tupperware, flavorings, kitchen items, books, vitamins, lotions, etc. Such items must somehow relate to the objective of the Farmers Market, as well as enhance and attract additional patrons. All are subject to approval strictly at the Market Manager’s discretion. A vendor who may produce specialty crops, unique items with a very short season, limited production or may wish to “try out” the market. Special consideration will be given to items not already offered at the market and participation is strictly at the Market Manager’s discretion. Vendor is responsible for all necessary Kane and/or DuPage County Health Department permits and licenses. An opportunity for Aurora area youth to develop social and business skills in a positive environment. Youth will be able to learn and hone their skills as they engage with established businesses. All participants must abide by fair market prices, conduct their business in a professional manner and will be civil and respectful towards each other, staff and customers at all times. Booths are available to any Aurora area youth, 16 years or younger. Participants must be accompanied at all times by a parent, guardian, teacher, or advisor. The booth must be staffed by the youth and not an adult. The youth is responsible for the selling of their goods and interactions with customers. Adults are not allowed to sell the youth’s products. Each youth is limited to (4) four sale dates per market per season otherwise regular vendor fees and rules will apply. All applicable state and local permits and licenses apply. Limited to not-for-profit, youth and social service organizations located in Aurora, or which serve a large portion of Aurora residents. They should operate solely for educational or charitable purposes, such as museums, clubs, social services and parks to use to inform the public of their activities and/or services. Limited to no more than (2) two market dates (subject to availability) at any market per season. You must provide a fundraising or interactive activity (craft or demonstration) which must relate to the objective of the Farmers Market and must enhance and attract additional patrons. All items for sale must be approved by the Market Manager. Bake sale and food items MUST be produced in accordance with all state and local health department regulations with all applicable permits and licenses. Any business or organization located in Aurora, or which serves a large portion of Aurora residents and which will provide and staff a specific amenity to the market. The amenity, service or activity must somehow relate to the objective of the Farmers Market and must enhance and attract additional patrons. Sale of certain items are allowed, distribution of all promotional items and similar must be preapproved by the Market Manager. Participation typically is for the entire season. 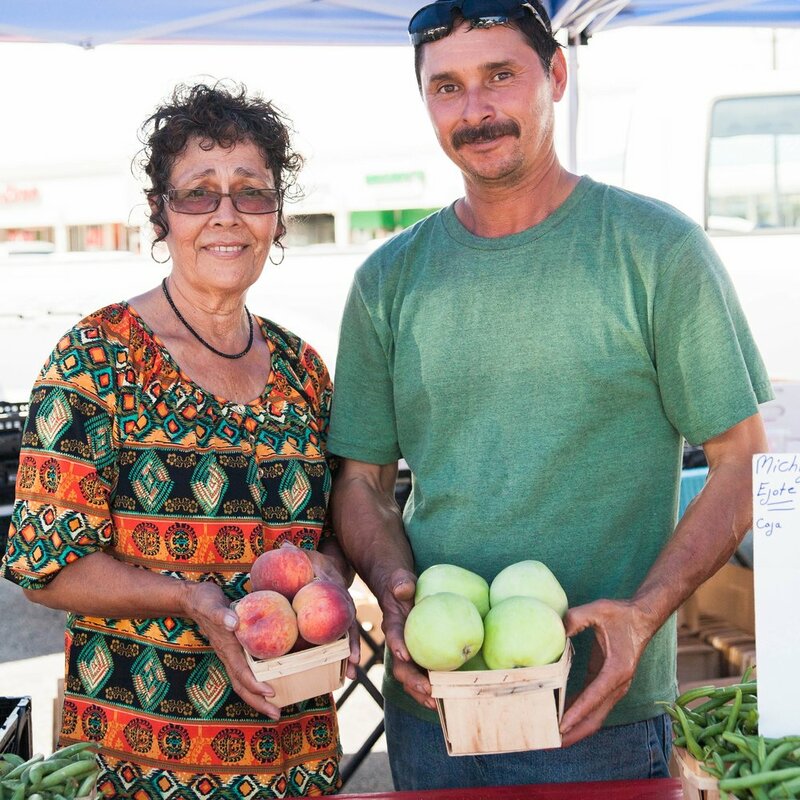 Aurora’s Farmers Market has become a weekly marketing opportunity for local businesses! Our customers are an excellent audience with direct marketing value to your organization. "Experiential marketing" drives purchases and consideration across age, gender, and ethnicity. 70% of consumers say that they would be more likely to purchase a product or brand after experiencing it at an event. Your sponsorship participation will reach far beyond each weekly market. Company representatives can relate directly to patrons in a casual and relaxed setting, showcasing products and services to our targeted demographic. Many opportunities are available and can be customized to match your marketing goals. Become a sponsor today! Just complete the Inquiry Form below. “Music @ the Market” - Aurora’s Farmers Market partners with local musicians and performers to offer ambiance to the market atmosphere. Our markets have become weekly events and showcases of the local community and Aurora’s “locally grown” talent. The “Music @ the Market” program entices patrons to linger longer, leisurely shopping, engaging with friends, neighbors, farmers and others. They often relax with a sweet treat enjoying the feeling of community that music brings to the market. Just complete the Inquiry Form below. Are you the type of person that lingers a little too long in the produce department? Do you have a top secret procedure for cooking the world’s most perfect ear of sweetcorn? Then it’s obvious that you’re an ambitious self-starter with a positive and outgoing personality along with great customer service skills. Additionally, you possess a superhuman and unnatural knowledge of local agricultural products with a propensity for eating only the best locally grown fruits and vegetables. (Bilingual Spanish would be an extra super double plus bonus). If this sounds like you or someone you know, then come join Aurora’s Farmers Market Volunteer Force! Our volunteers are a Tour de force, force majeure and a force to be reckoned with! Just complete the Inquiry Form below.